UNITED NATIONS, August 4 -- Sudan threatened to shoot at a UN helicopter seeking to take three injured Ethiopian peacekeepers for medical treatment from Abyei, the UN belatedly to the Press on Thursday in response to a follow-up question. The three peacekeepers died. On August 3, Inner City Press had asked UN Secretary General Ban Ki-moon's spokesman Martin Nesirky if the UN for its UNISFA mission in Abyei had signed a Status of Forces Agreement or SOFA with the Khartoum government. Nesirky replied, "I would need to check on the precise technicalities there. But I can tell you that the deployment has been continuing." Later on August 3 when Ban spoke to the media, Ban did not mention anything about Abyei or Sudan, and Nesirky did not allow Inner City Press any questions. On August 4 Alain Le Roy, the outgoing chief of the UN Department of Peacekeeping Operations, was asked about the four deaths in Abyei. Le Roy acknowledged that while one peacekeeper died the instant the land mine exploded, three were still alive. But, he said while referring to Status of Forces Agreement, permission was not received to Medivac the three injured peacekeepers out. Inner City Press asked a follow up, which Nesirky has still failed to answer: does the UN have a Status of Forces Agreement with Sudan for the Abyei mission? No, Le Roy said, the SOFA for UNISFA "has not been signed yet," adding that the SOFA of the now-expired UN Mission in Sudan is then still in place. Inner City Press asked, then why didn't the UN fly the peacekeepers out? "The government prevented us to take off... by threatening to shoot at the helicopter," Le Roy told Inner City Press. Video here, from Minute 46:56. Audio here, from Minute 46:53. Moments later, Inner City Press asked Nesirky why Ban hadn't mentioned this when he spoke to the media the previous day, since the threat and the death of the peacekeepers, even if somehow not causally connected, happened at the same time? Nesirky called this "hypothetical," and did not address why Ban had said nothing publicly. Video here, from Minute 56:32. Some wonder, is this the so-called "quiet diplomacy?" 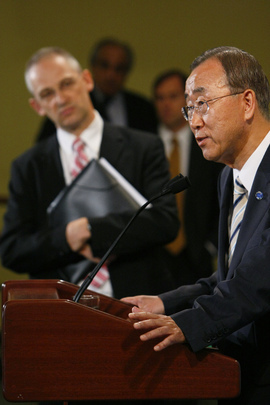 Ban met with Sudan's Ambassador to the UN, but said nothing publicly. Nor has Nesirky answered repeated questions from Inner City Press about how many UN peacekeepers remain in Southern Kordofan, and what if anything they are doing to protect civilians. Watch this site.